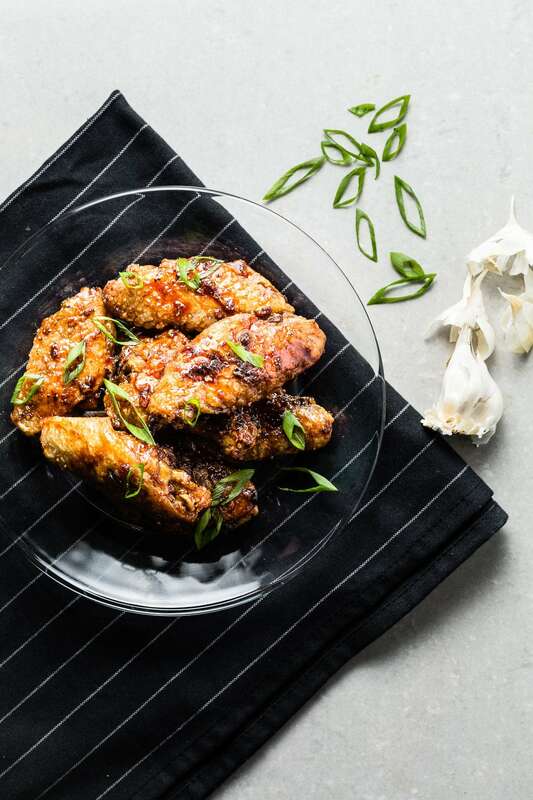 These honey-garlic air fryer chicken wings are for you if you love crispy, sticky, sweet and garlicky wings. Not all wings are created equal. There are really great wings and there are bad wings, and not much in the middle; none are worth eating if they aren’t great. I’m just going to say that my wings are the best and definitely the easiest to make. Want to be a wing master like me? 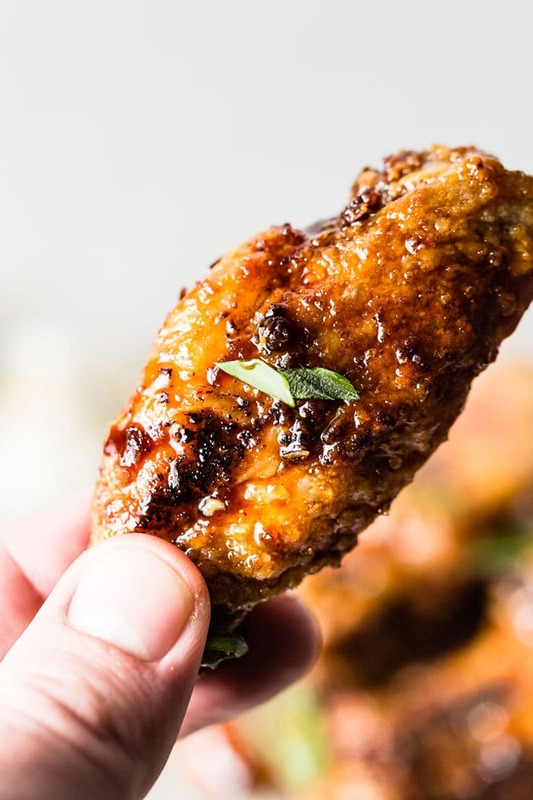 Ok, I’m not really a wing master, but you will be feeling like one after you make these. The great thing about wings is they often come ready to go. Sometimes you just need to break them down into drumettes and wingettes, and cut the wing tips off, which is super easy. Simply cut the wing tip off with a very sharp knife, then cut through the skin at the joint to break them down into drumettes and wingettes. The reason you break them down into pieces is because they cook quicker and it makes them last a little longer at your party. The wing tip gets cut off because it is the thinnest part and can over-crisp during cooking. Once you have an air fried wing, you probably won’t ever go back to anything else. One of the biggest benefits of air fried wings is that not a single drop of oil or fat is added to the wings to get them crispy. The extremely hot air that is circulating around the wings at high speeds does all the crisping work so no additional fat is needed. The health benefits of air fried chicken wings are all on the mental side. Let’s face it; wings are not the healthiest thing to eat no matter how you make them, but they are one of the most satisfying. 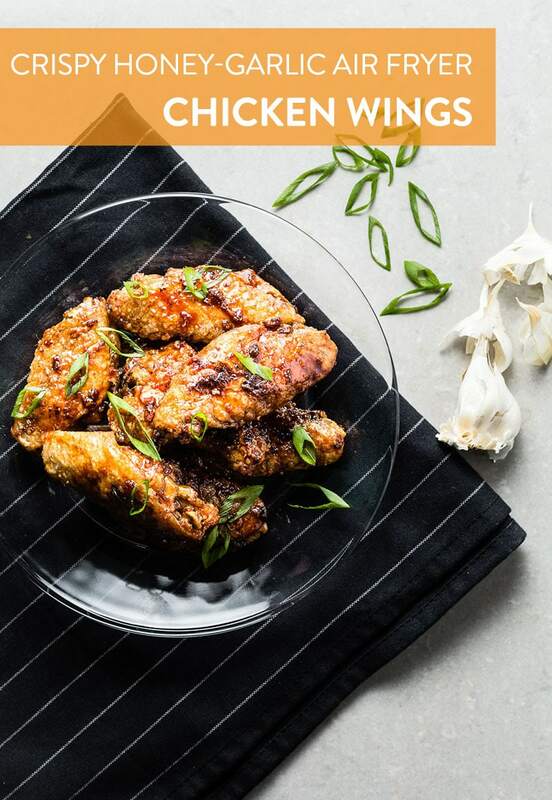 If you are going to eat wings, they are definitely healthiest when made in an air fryer. Trust me though; there is a strong positive mental boost when you eat a crispy wing and if you balance them with a super-healthy veggie and salad, and it should pretty much even out, right? The air fryer does make them as healthy as possible, while rendering off some of the fat and not adding a single drop of oil. I don’t believe in secrets when it comes to cooking, so here it is. The best way to get super-crispy wings is to dredge them in potato starch. This gives them a very light and gluten free coating that will make you swear they came from the deep fryer, but without the grease. While your wings air a fryin’ (see what I did there? ), make the super simple honey-garlic sauce that will coat them with deliciousness. The sauce consists of a little butter, minced garlic, honey and soy sauce. Yep, that’s all you need. 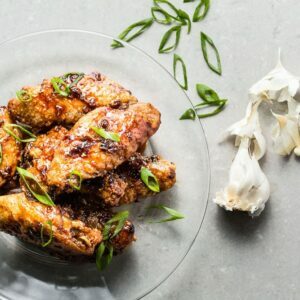 Cook it on low for about 10 minutes and it’s perfection for your wings. Drizzle on as much sauce as you like when they are hot out of the fryer. I like to pre-heat my bowl just a little bit so the hot wings don’t suffer from the shock of cold metal cool down. I’ve never met anyone who enjoys that feeling, and hot wings are no exception. How many wings per person? An entrée size portion of wings is about 1 pound per person, or about 8 wings. As an appetizer, 4 wings / 1/2 lb per person is a good number. With that being said; these wings are so freakin’ good that you might just need to double that number for a hungry crowd. 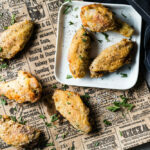 Can you air fry frozen wings? 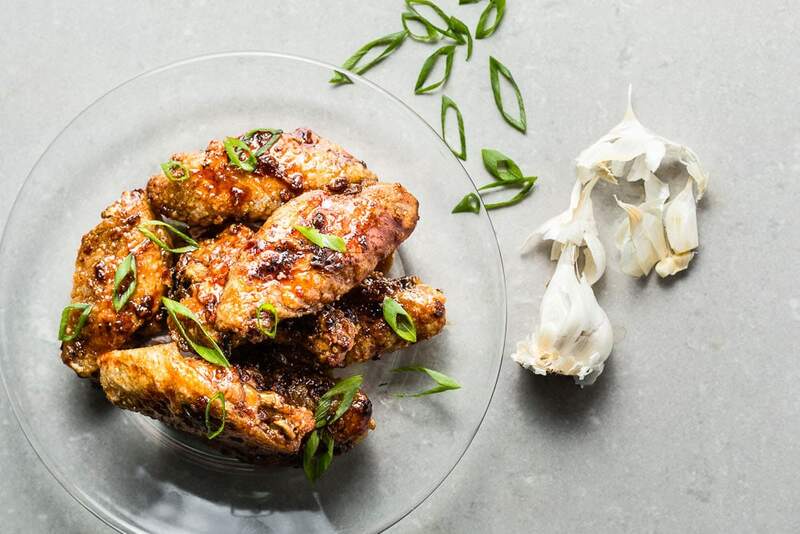 You definitely can air fry frozen wings. You want to remove ice crystals and dry them as much as possible, as excess water reduces crisping. The potato starch does a great job at drying them off. You might need to add a few extra minutes to the cook time, but because wings have such little meat on them, they defrost quickly. Breville supplied me with product for this post. All opinions and thoughts are always my own. Pre-heat the air fryer to 375 degrees. Season the chicken wings lightly with kosher salt and dust with garlic powder on all sides. Place the potato starch in a shallow bowl, then coat the chicken wings on all sides, shaking off any excess starch. Transfer the wings to the air fryer basket with room between them so they aren't touching to allow for the air to flow on all sides. Air fry the wings at 375 degrees for 20 minutes. 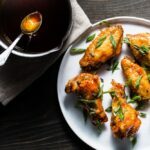 Increase air fryer temperature to 425 degrees and continue to cook for 15 more minutes; turning the wings a few times while they cook to ensure even crisping. While the wings are air frying, heat the butter and the garlic over medium-low heat in a small saucepan until it is melted, being careful not to brown the garlic. Stir in the honey and soy sauce and continue to cook until the sauce thickens, about 10 minutes. Set the sauce aside and keep warm. 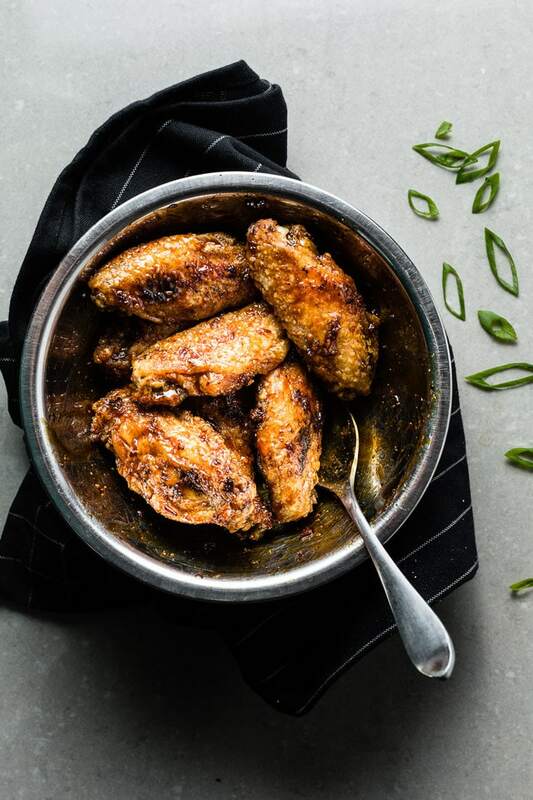 When the chicken wings are crispy and cooked; transfer them to a warm bowl and mix with the desired amount of honey-garlic sauce plus some thinly sliced green onions for garnish. Enjoy immediately. For easier clean-up, I like to place a foil-lined baking sheet below the Breville air fry basket to catch any drips. 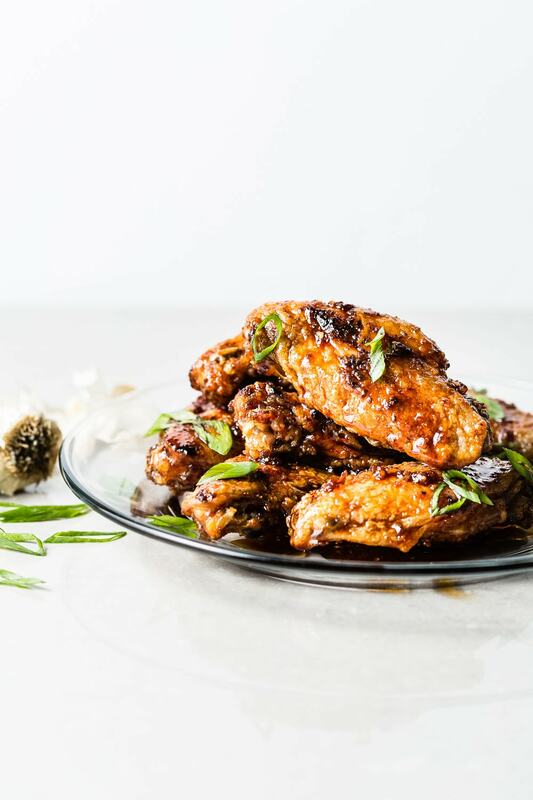 If you don't have an air fryer, the wings can be cooked in a convection oven, but cooking times might be slightly longer. Contains affiliate links where I might receive a small commission if you make a purchase, at no additional cost to you. Super Bowl appetizer recipes that are quick, easy and healthyish. 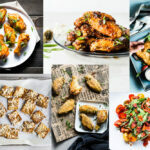 Yum…probably my favorite of the three chicken wing recipes from this site. Can’t wait to try more. I need clarification. 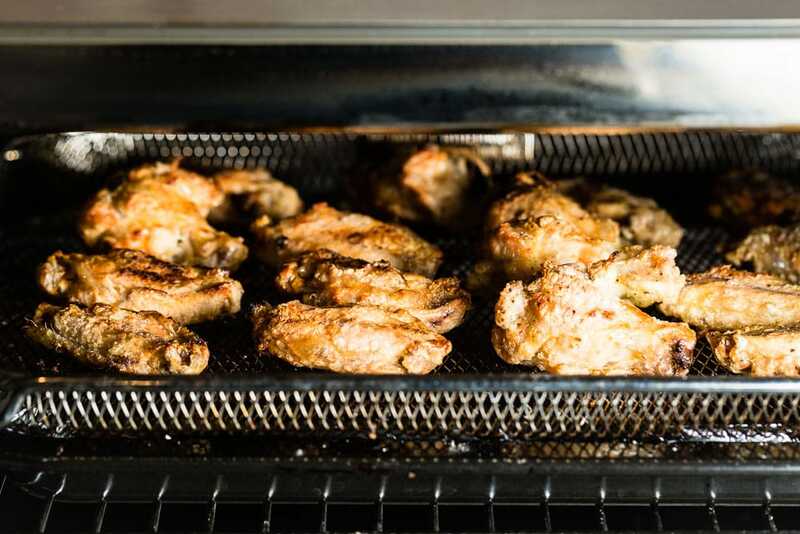 Does the foil go directly under the air fryer basket on the same rack? Or does the foil go under the air fryer basket on a different rack underneath the fryer rack? Hey Heidi! Foil goes on the rack below the basket, not on the actual basket. This is when using a Breville Smart Oven Air, and does not necessarily pertain to all air fryers.